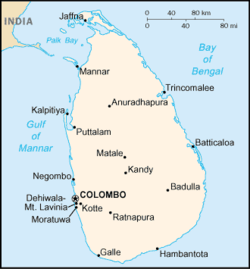 The main island the island nation of Sri Lanka, itself known as Sri Lanka (formerly called Ceylon, Lanka-dvipa, Simhala-dvipa, etc. 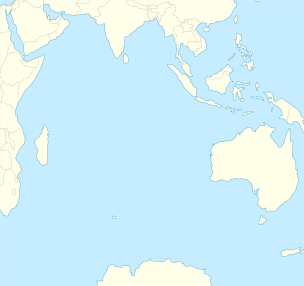 ), is a South Asian island in the Indian Ocean, southeast of the Indian subcontinent, in a strategic location near major Indian Ocean sea lanes. It has a total area of 65,610 km², with 64,740 km² of land and 870 km² of water. Its coastline is 1,340 km long. Sri Lanka's climate includes tropical monsoons: the northeast monsoon (December to March), and the southwest monsoon (June to October). Its terrain is mostly low, flat to rolling plain, with mountains in the south-central interior. The highest point is Pidurutalagala at 2,524.13 m. Natural resources include limestone, graphite, mineral sands, gems, phosphates, clay, hydropower. Rama's Bridge, a shoal "connecting" (northwestern) Sri Lanka (Talaimannar on Mannar island in that district) and (southern) India (Dhanushkodi (extinct)/Rameswaram in Ramanathapuram District) between the Gulf of Mannar (southwest) from the Palk Strait (northeast). Sri Lanka map of Köppen climate classification.